When training sales teams on MEDDIC, I observe that most sales people are not acting on the METRICS they obtain from the prospect. They are not leveraging the power of the METRICS into a nice, easy, convincing, pertinent ROI story. (Return On Investment). Metrics without ROI is as useless as Knowledge without Action. It’s like measuring your body fat, becoming aware that you’re overweight and then doing nothing about it. You need to show how metrics translate into dollars. Either they help increasing revenue/income or they contribute in decreasing costs. 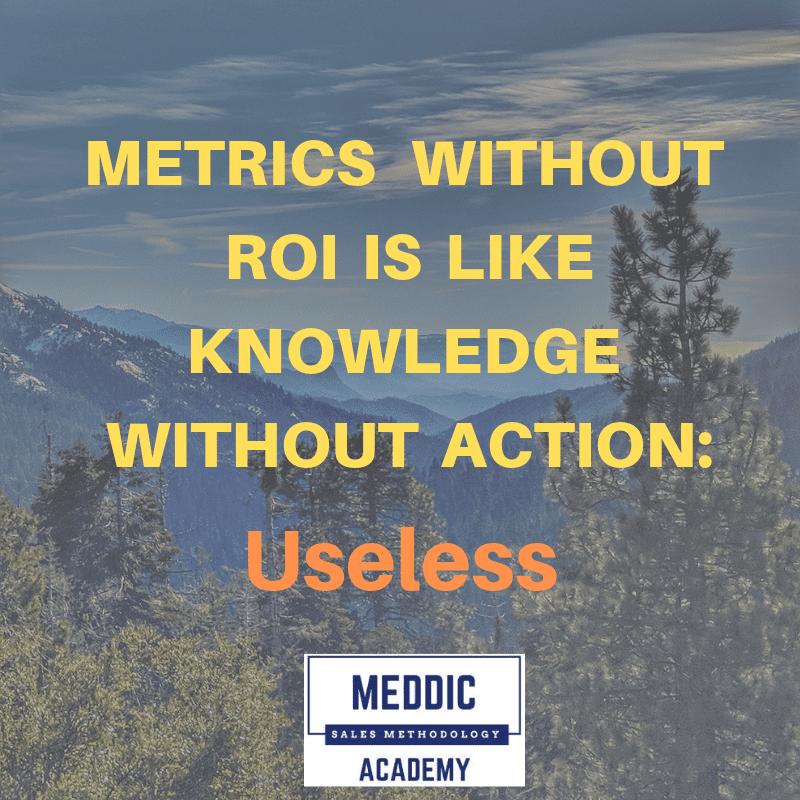 The whole purpose of METRICS within the MEDDIC methodology is to show the economic impact of your solution. You need to have a process which will transform your METRICS, almost automatically into a monetary SAVING or GAIN. Because that’s what the economic buyer is interested in. That’s the reason why the customer buys your solution to start with. And that process is what you learn during our ROI course. Our ROI mini course, is a 15 min video lesson, practical, to the point and immediately applicable. It provides sales teams with a very simple process of transforming METRICS into a PAYBACK PERIOD. You don’t need to be a financier in order to develop or to understand it. It’s very easily accessible to everyone, unlike the stereotype of a ROI prepared by a Mc Kinsey consultant. Your Champion can also easily understand, acknowledge and see that you have a credible story for the Economic Buyer. You learn how to prepare it easily, both in the case of INCREASE of revenue or sales and in the situation of REDUCTION of time or costs (savings). Enroll in our METRICS based ROI course today here and rock your numbers! UPDATE 4/15/2019: Based on the above observation, we decided to include the ROI course in the full MEDDIC bundle, as of 5/1/2019, so that everyone can take it. Read this post for details.